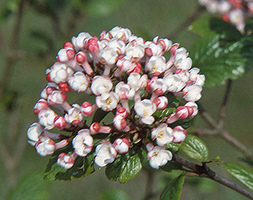 Clusters of bright red buds open in spring to headily-scented, white flowers, which retain a red flush on the outer edges of the petals. They are wonderful in cut flower arrangements as the flowers will fill your home with their delicious perfume. In the garden, make sure they are planted near a path or entranceway so you can enjoy them each time you pass. The foliage is a lustrous green, and will usually stay on the plant throughout the winter once it gets a little older.